Our group’s visit to the City of David would involve walking through a dark, slippery underground tunnel with water possibly up to our hips. For an unstable ankle, this just seemed like an accident waiting to happen. Once everyone realized I was staying behind with Yotam to help keep an eye their bags, we received a slew of requests: “Keep your eye on this one- my camera’s in there!” “Make sure nobody gets my bag!” “The other bags don’t matter- just protect mine!” We both laughed. After all, how hard could it be to guard a completely stationary pile of bags for an hour? Oh ho ho, dear readers. So I missed all the wading through icy water, the slipping and sliding, the dark tunnels, the flashlights, the group singalongs, the city itself. But you know what I didn’t miss? That sounds like the end of our troubles, right? Wrong. About ten minutes later, a group of schoolchildren poured in, not for the bar mitzvah, but for a picnic lunch. Since the only clear area at this point was exactly where Yotam and I were sitting (tables had been set up everywhere else) the kids sat down all around us, chattering and throwing candy at one another. They received the same spiel from Bar Mitzvah Lady, but I suppose their teacher convinced her that it was going to be far too much trouble to move a group of kids after they’d settled down.3 So our quiet conversation was joined by about twenty Israeli kids, all of whom wanted to know where I was from (“Have you met Obama”), how much Hebrew I spoke (“I’ll teach you a bad word”), and whether I liked bissli (“You have to have it with bamba“). So they were pretty much just like Moroccan kids. A few of the girls stared lovingly at Yotam and giggled, while the boys grilled me about my politics. “Do you like John Kerry? We hate John Kerry. He hates Israel.”4 Soon all the kids were shoving snacks into my hands–with instructions on the proper way to consume them, as if I’d never seen candy or chips before–while Yotam sat quietly making faces at them. I decided to be a bad influence and teach them how to make a loon call with their hands. If you haven’t seen anyone do this, you basically cup your hands together and blow into them and it produces an ungodly shrieking whistle that annoys teachers and makes you the envy of all your friends. One of the kids already knew how, and coached his friends until they were red-faced and out of breath. Yotam handed out candy that materialized from somewhere in his medic bag. Soon, the teachers rounded up all the kids, who departed cheerfully, yelling obscenities and waving. It was suddenly very quiet. Things livened up a bit when our group returned, but it just wasn’t the same. 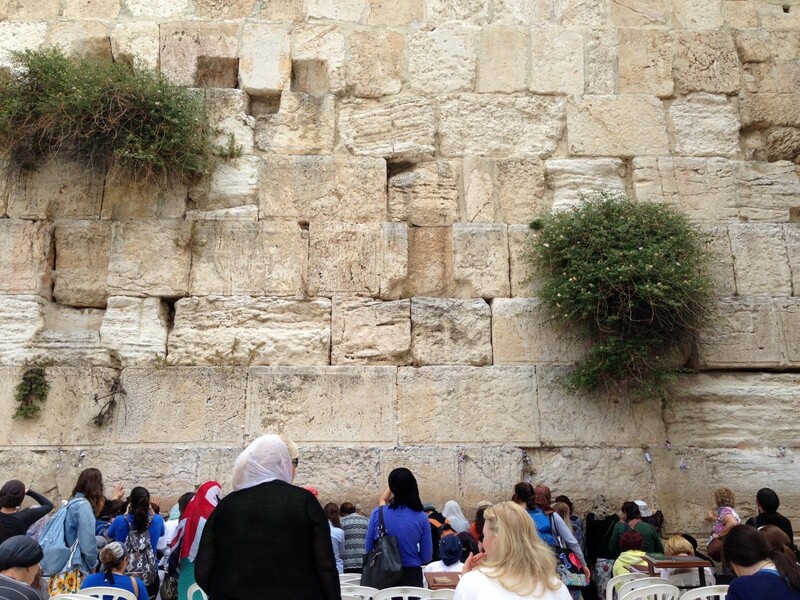 One of the things that you hear constantly about Birthright is how moving this experience is. Countless people will tell you in their blogs and videos how inspired they were, how spiritual they felt, and–in many cases–how they were brought to tears, surprising even themselves. So I’m probably going to sound callous when I say this, but… it was a wall. It was very old, very tall, and there were a lot of people having profound experiences in front of it. I was not one of them. I waited for my turn to go up, found a crack in which to wedge my papers, then quietly retreated to the back. I sat in a white plastic chair, hoping that if I observed and reflected long enough I would feel something. Nope. After our group had reassembled, some teary-eyed and some hungry, we walked to the Old City where–you guessed it–we were given one hour for lunch and exploration. That’s right, one hour to explore the entire Old City of Jerusalem. I dashed off7 down the nearest side street, determined to make the most of my time and lodge a complaint later. I passed souvenir shops and cafés, tourists dragging around cranky kids, locals running errands. I passed ancient buildings, narrow archways, beckoning shopkeepers. As I walked, I started to feel more and more at home. I passed a shop crammed full of brooms, tupperware containers, and silver teapots that–oddly–made my heart ache for Morocco. I felt like I was walking into the Tangier medina.8 Sure enough, shop signs began to change from Hebrew to Arabic, and I smelled a familiar scent. Mint tea! Just to my left, there was a little alcove filled with bags of fresh mint, kettles on a stovetop, and a sullen-looking man. I was so excited about this discovery that I walked right up and ordered a mint tea in darija, which, of course, this guy did not speak. As a result, I got a sugar-free mint tea instead of half-sugar, but it didn’t matter. I was elated. I sat on one of the plastic stools lining the narrow street,9 sipped my tea, and chatted with a couple of Israelis drinking coffee next to me. I even thought to ask them what the correct price was, in case the guy tried to fleece me. He didn’t, though, and I headed back across town. Sugarless mint tea, still delicious. So I did. 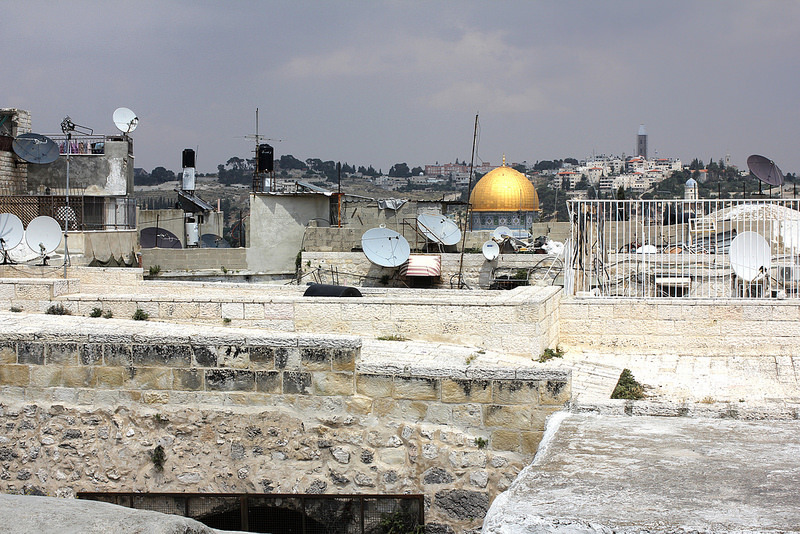 I found myself on the rooftops of Jerusalem, looking out over chimneys, satellite dishes, clotheslines, synagogues, and mosques. A school group sat nearby, eating lunch and enjoying the view. I listened to the noises of the city, felt the sun on my face, and realized how brief an hour was for a place like this. Back on the street, the shopkeeper called to me again. “Come look at this map!” I smiled and shook my head, continuing up the hill. He called after me, “Really, I just want to show you the best parts to see.” I sighed and headed his way. He had, after all, given me a pro tip about that view. Inside the shop, he pulled out an extra stool for me, then sat down with a cup of coffee and the map. He explained that he just liked to have company while drinking his coffee, then showed me the four quarters of the city; Jewish, Muslim, Christian, and Armenian. As a Bedouin, there was no quarter for him. He asked if I’d seen the mosques, churches, and synagogues. No. What about the rest of the Jewish Quarter? No. 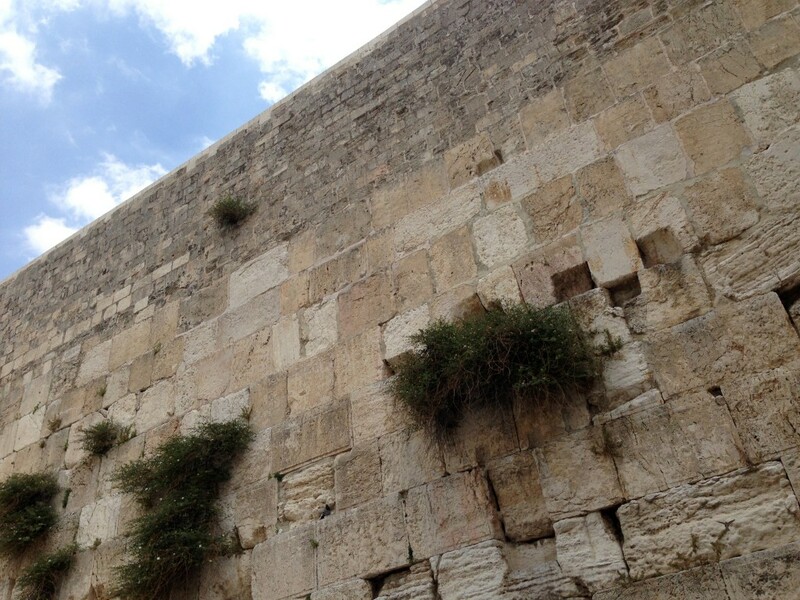 How long was I in Jerusalem? I checked my watch. Thirty minutes. I explained a little about our trip and the time restrictions. He shook his head. One hour in the Old City was not enough. 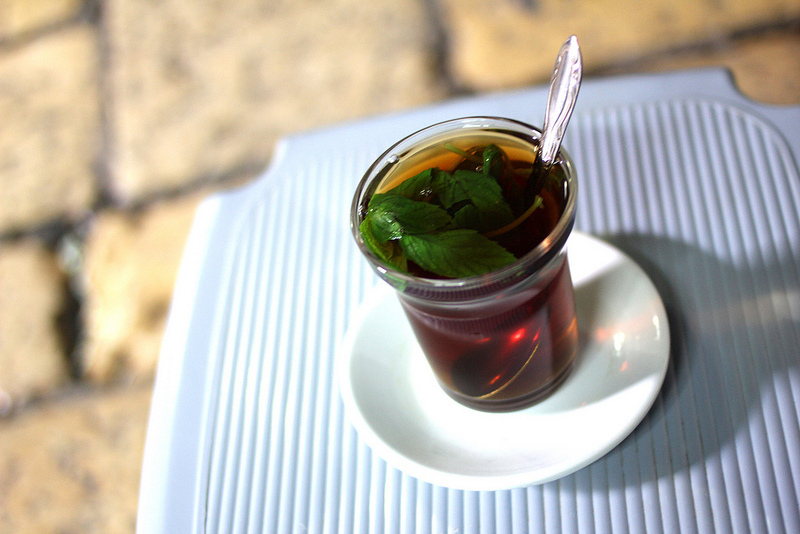 He poured me a glass of mint tea and we talked about art and Bedouin culture for thirty minutes.10 And when I left, he gave me a business card with his name–Munir–and address scrawled across the top so I could find my way back, whenever that was. Mint tea sloshed around in my tummy as I ran, wobbly-ankled, back to the group meeting spot. 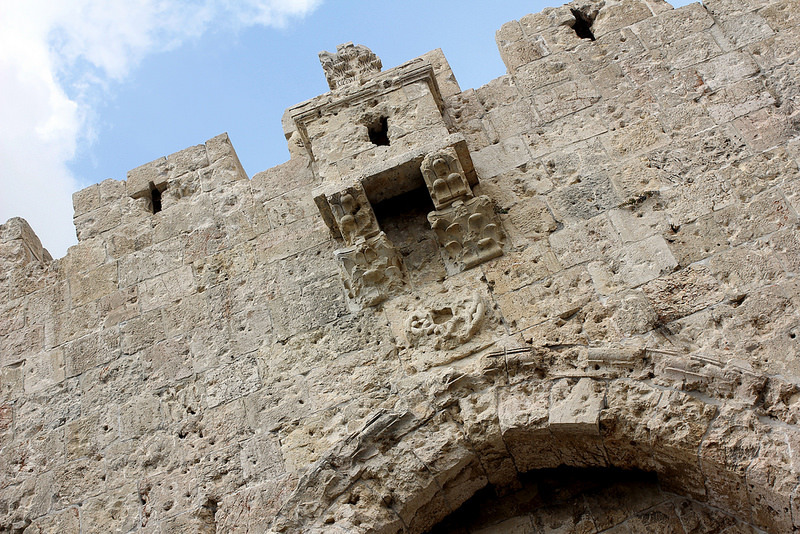 One of the gates of the Old City. 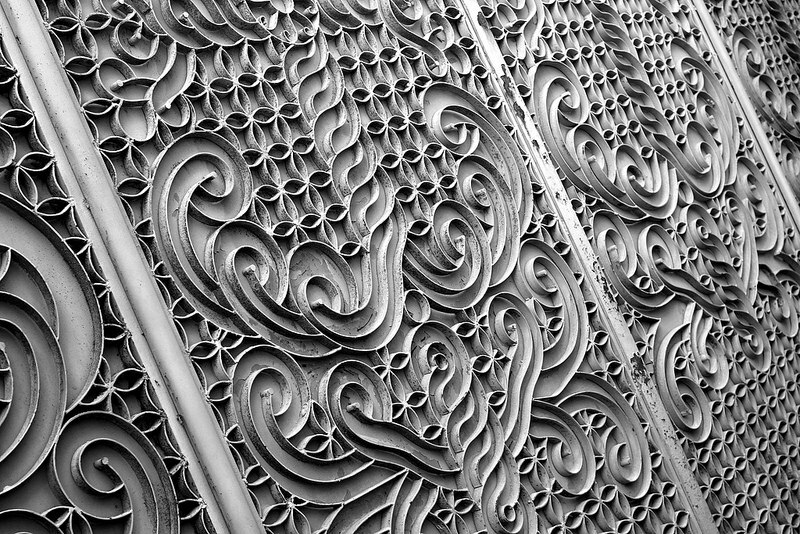 Ornate details near the gate. We walked to the Tomb of David, where Moran offered to translate a lovely poem inscribed there. Later, we stopped off at an overlook and enjoyed the view of Jerusalem from above. 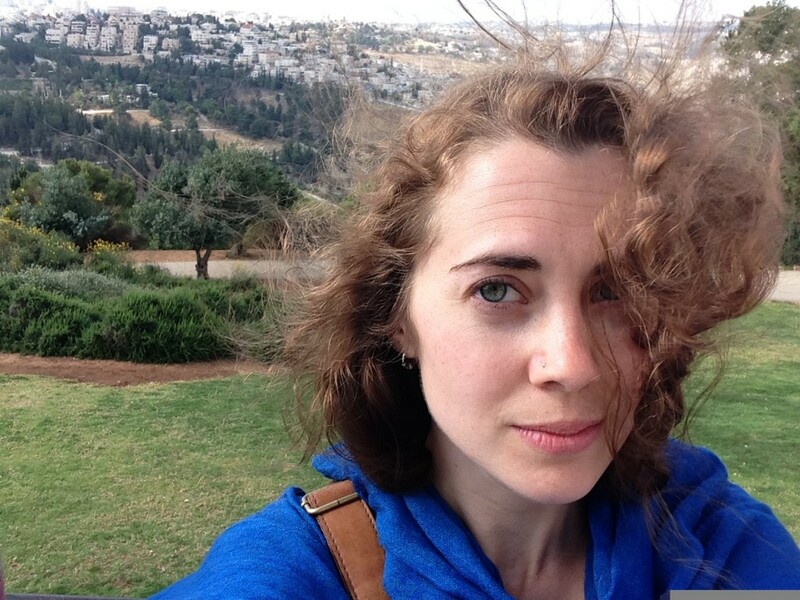 A rare and windy photograph of me above Jerusalem. Our final activity of the day, in preparation for tomorrow’s visit to Yad Vashem, was an open-ended discussion of family Holocaust stories and reflections on antisemitism. The Holocaust means different things to everyone, especially now, almost 70 years later. Not to sound preachy, but I’ve always believed that it should be important to every human being.13 Holocaust remembrance isn’t just about honoring the dead; it’s about moving forward, driven by a horror of what people are capable of and a hope that we can improve. Beyond this, I’d never felt that the Holocaust affected me personally. My great-great-grandparents immigrated to America in the early 1900s to escape Russian pogroms, leaving part of their family behind. Nobody in my family is a Holocaust survivor. Previous PostIsrael, Day Five: I Know Jew Are, But What Am I?